Honey bees are social insects found all over the world. They pollinate more than 100 crops in the U.S.
Honey bees are active pollinators and produce honey, which they feed on during the colder months. 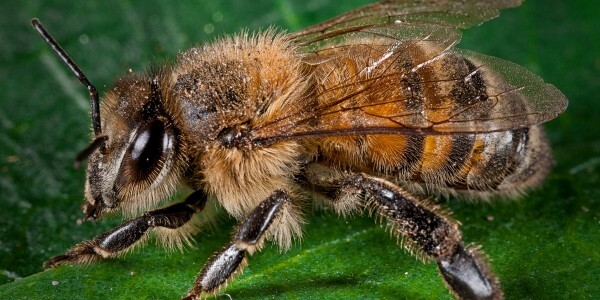 The honey bee is the only social bee in the U.S. whose colony can survive many years. They collect nectar and pollen from the flowers they visit. Honey is produced from the nectar of the plants they pollinate, and is stored in honeycombs in their nests. Pollen is the protein source of the honey bee and is stored separately in cells in the comb. Most often, they build nests in tree crevices but will occasionally nest in the side of buildings, attics or chimneys. Honey bees do sting, but they can only sting once. However, disturbance of a nest can result in multiple stings, because of the number of bees which may respond to the disturbance. The sting can be extremely painful if the stinger is not immediately removed from the skin. People who are allergic to insect stings may have a more severe reaction.